Just to throw it back a little, part of my 2017 resolutions/goals was to no longer drink coffee or soda. So far, I've done pretty good. I've had maybe one cup of coffee and some sips here and there since the new year and I am a juice fanatic so giving up soda wasn't too hard. But, one drink that I would not be able to give up, would be tea. Which in my mind is fine because it is great for you... except for when I add loads of milk and sugar to it, but whatever. When I was asked to give this teatox a try, I wanted to do my research first! 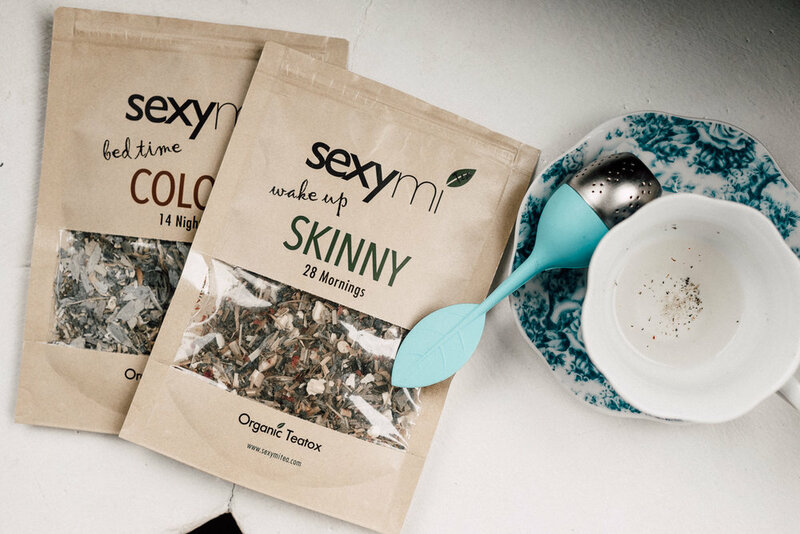 Sexymi Tea is the healthiest, cleanest and highest quality teatox on the market. Now that says a lot about the company right off the bat. I read on and found that they spent an extensive amount of time and effort trying to find the best possible formula to give their customers the best possible results. The benefits of the 28 Day Teatox includes eliminating toxins, bloat, increases energy levels, improves focus, burns stored fat, and boosts your metabolism to improve your health AND all ingredients are completely natural. After doing this teatox, I am now able to share my own personal testimony... I started out with the teatox, and was impressed to see that by day 4, I had already lost 2 lbs. AND my skin CLEARED UP so well! Now I'm about to be real honest, I have always had a super slow digestive system but with the "bed time colon" tea, my digestive system became more regular which was awesome as well. Throughout my time doing this teatox, I decided I wanted to just go full out. I did my best to start eating really clean and started working out. After losing a few pounds, my weight ended up maintaing itself for the rest of the teatox because I started to gain muscle from working out. So although I didn't necessarily lose a ton of weight according to the scale, the percentage of body fat went down. My results may be different than others since I don't really have a whole lot of weight that I should be trying to lose in the first place, but I do want to tone my body and that's why I am okay with the fact that I didn't lose lbs. and lbs. and lbs, instead, the weight just transferred from fat to muscle. I feel that the teatox, eating clean, and working out all played a role in making my results what they are. For anyone who is struggling to lose that extra little chub that you stored up over the winter, give this a try! I really do recommend it, and if not for the weight loss, do it for the health of your skin and body. That probably was the biggest factor in my experience, I loved that my skin cleared up and my body and tummy felt pretty happy too! If you're a "sceptist" like I am, check out their website here and see for yourself all of the great things this company is all about! If you want to give it a try, I HAVE A DISCOUNT CODE FOR YOU!!! Yay! When you go to check out, just enter thechic20 to receive 20% off your 28 Day Teatox order (which includes the tea infuser). I hope I get to hear some success stories from you all if you decide to go for it! Best of luck!